A pile-up of unresolved investigations. A sharp drop in the number of cases closed. Allegations from at least four employees of a hostile working environment. 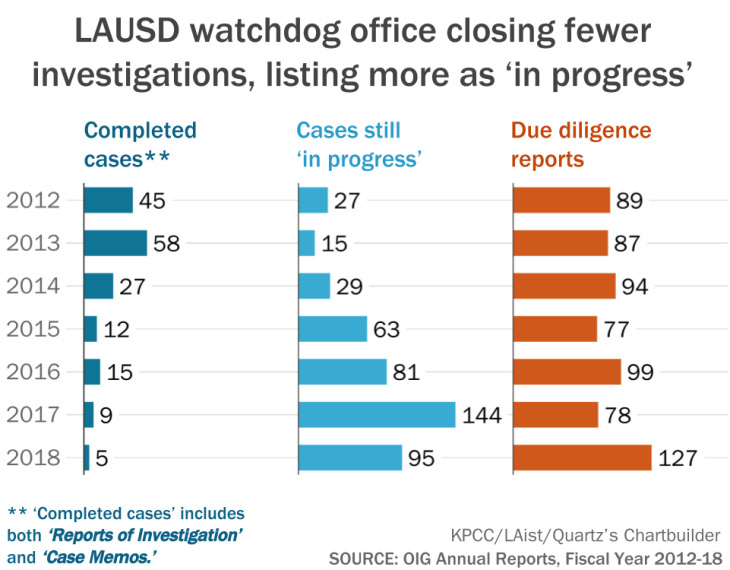 These were the findings of a KPCC/LAist investigation published earlier this month into how Ken Bramlett ran the Los Angeles Unified School District's Office of the Inspector General — the powerful internal watchdog unit that polices LAUSD from within for waste, fraud or mismanagement. For L.A. Unified School Board member Nick Melvoin, KPCC/LAist's reporting reflected doubts he'd harbored about Bramlett. "My assessment of the prior inspector general," Melvoin said in an interview, "was that no, the work product wasn't up to a quality that I would expect." During a closed-door meeting in June 2018, board members declined to renew Bramlett's contract. Bramlett left LAUSD shortly thereafter. In his interview, Melvoin acknowledged that his concerns about Bramlett's ability to manage the office's culture and caseload played a role in that decision. Melvoin also noted that the board has already taken action to address those concerns: "We brought in a new inspector general," he said — William Stern, a 20-year FBI veteran, who began at LAUSD in January. Two candidates running in a special election for an open LAUSD board seat — Heather Repenning and Jackie Goldberg — also said KPCC/LAist's findings raised concerns about the rate at which the Office of the Inspector General was addressing cases. "I do think Ken Bramlett was kind of disappointing," Goldberg said, though she stressed she didn't have inside knowledge of the OIG's work. It is very disappointing to see that the person appointed to fight waste and mismanagement at LAUSD isn't showing up in the same way, or barely at all. Closing less than 5% of internal investigations is unacceptable. In two stories this month, KPCC/LAist reported that at least four OIG employees had filed formal complaints alleging Bramlett — or his top deputy overseeing the investigative unit, Frank Cabibi — fostered a hostile workplace culture. OIG employees also alleged Cabibi's management style was causing a backlog of unresolved investigations. Sources said Cabibi was eager to open cases, but not to close them. After Cabibi left LAUSD, OIG staffers found at least 25 cases sitting in a credenza in his office, ready to close, according to one document obtained by KPCC/LAist. To Melvoin, the reporting touched on a critical issue: "Who's watching the watchdogs?" The Office of the Inspector General, or "OIG," polices more than $9.6 billion in district spending for "waste, fraud and abuse." The office also employs "about a dozen" investigators to ensure LAUSD's 63,000 employees don't misbehave on the public dime. Armed with subpoena powers, the scrutiny of OIG investigators has gotten contracts canceled and employees fired — or even criminally charged. The OIG reports directly to the LAUSD board, not the superintendent — an arrangement that's supposed to make the office more independent from the district's administrative power structure. 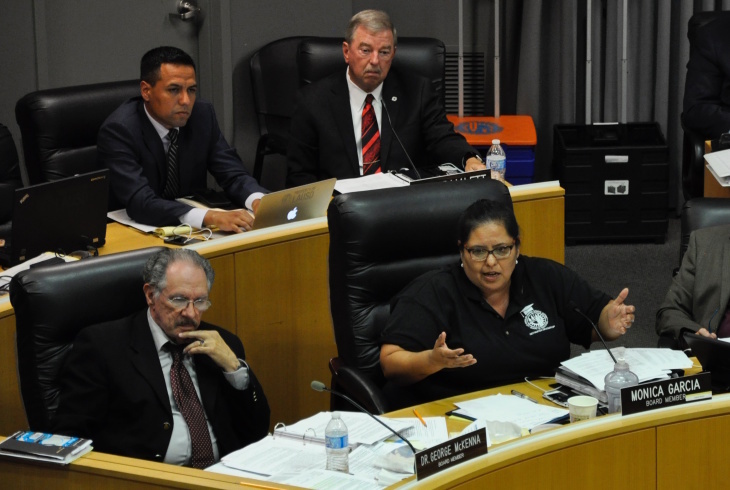 "When issues internally — like to this office — arise, and the board is made aware," president Mónica García said in an interview with KPCC/LAist on March 12, "the board has a responsibility to address them." García expressed confidence in the new inspector general, but did not speak directly to specific concerns about Bramlett or Cabibi, saying she was prohibited from discussing "personnel-related" matters. Three other board members declined to comment for this story: Kelly Gonez, Scott Schmerelson and Richard Vladovic. A fourth board member, George McKenna, didn't respond to multiple requests for comment. In "watching the watchdogs," LAUSD board members must perform a balancing act: they must ensure, on the one hand, that the OIG wields its extraordinary powers fairly, and they must do so without applying political pressures that might shut down important inquiries. On the other hand, board members have also had to push back against critics who would prefer LAUSD's watchdog be kept on a shorter leash. HOW CAN WE KNOW THAT THE INSPECTOR GENERAL IS DOING A GOOD JOB? In an interview, the new Inspector General William Stern said he hoped the office would be judged by the quality of its work product, not the quantity of investigations. Stern noted the OIG publishes all of the reports produced by its auditors and makes public "as much as we possibly can" without breaking state law, which keeps all OIG investigations and work product confidential. Stern also said it's not fair to focus only on the numbers of cases closed, since the counts don't reveal how many of those cases were simple or complex. Consider: During Bramlett's tenure, the OIG played a role in the district's infamous iPad debacle and first raised red flags about a former LAUSD food service director who recently pled guilty to criminal charges. District officials had also referred to the OIG at least one matter involving ex-LAUSD board member Ref Rodriguez, who resigned last summer. The dip in case closures might mask the importance of this work. Melvoin, Goldberg and Repenning all agreed that there's only so much the raw numbers of cases open and closed reveal about how good a job the IG's office is doing. But Melvoin said there are metrics worth tracking. He said he had discussed with Stern possibilities for metrics tracking the OIG's performance, like the ratio of criminal charges to cases brought or the number of personnel actions taken. Melvoin said they also discussed tracking how much questionable spending the OIG identified — a figure that OIG already publishes in its annual reports, but that the board might look to emphasize. "You can see a world," Melvoin said, "where [the OIG] is cost-neutral — that it's recouping to pay for itself." HOW LONG A LEASH SHOULD THIS WATCHDOG GET? In both 2016 and 2017, charter school advocates made attempts to limit the OIG's role. As spokesman Richard Garcia said in an email last week, the California Charter Schools Association wants the OIG to more clearly define the scope of an investigation at the outset, with "district roles outlined and details on the nature of each investigation established in plain terms." "Your piece," Richard Garcia's statement continued, "highlighted a need for such change within the office and the process." But Goldberg said she believes the charter association simply chafes at the idea of any oversight at all. "I don't think anyone is exempted from a good look by the IG if there's a reason to believe there's a problem," she said. Melvoin said the complaints from charter operators reflected broader concerns about how the OIG was handling cases. The first step in addressing those complaints was hiring a new Inspector General, Melvoin said. "I led the charge in making sure we brought in a more effective IG," Melvoin said, "because we believe in the mission of this office." Melvoin, Repenning and Goldberg all expressed confidence in Stern, saying it appears he has the credentials to be successful in his job. Repenning said ensuring the Inspector General lives up to expectations is the board's responsibility. "The onus is on the board," said Repenning, "to develop a set of measures and mechanisms so that the people running the office know that this is the bottom line expectation for annual work product."